Italian Quick Reaction Alert (QRA) combat aircraft flew from Gioia del Colle AFB to intercept an Egyptian aircraft due to missed radio contacts. Today two Italian Air Force F-2000 Eurofighter combat aircraft, in quick reation alert (QRA) for airspace surveillance, took off from Gioia del Colle AFB, home of the 36th Wing, to intercept an Egyptian Falcon 20 directed to Ciampino airport, Rome. The civilian aircraft had missed the radio contacts with the Italian air traffic control authorities. The two Eurofighters intercepted and identified the aircraft in a short time and escorted the plane until the crew has restored radio contacts. During the morning the Falcon 20 landed safely at Ciampino airport and the two fighter jets returned to their home base. 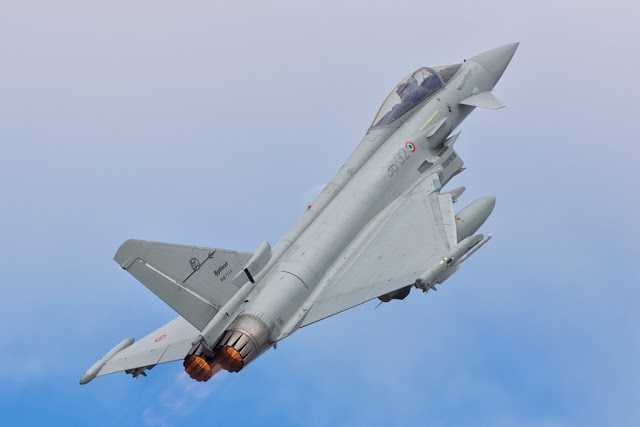 The Italian Air Force carries out surveillance of national airspace 24 hours a day, 365 days a year, with Eurofighter aircraft assigned to the 4th Wing of Grosseto, the 36th Wing of Bari and the 37th Wing of Trapani. The Italian Air Force also supervises Albania's airspace since 2009, and Slovenia's airspace since 2004, along with Greece and Hungary. In addition, it has carried out the NATO Air Policing mission in Iceland, in 2013 and 2017, in the Baltic countries in 2015 and it is currently engaged in Bulgaria.